I am sending out a plea to Parents of Autism and Special Educational Needs (SEND)…A plea to the Mums and Dads who think that their vote won’t count, the “why bother’, “no-one listens to us” families, the families who have been let down by the current Government and the failing system we have so far endured on behalf of our children. I appeal to the disenfranchised mothers and fathers of children with Autism and SEND who have so often been devastated by a broken system and left with a feeling that there is no change possible for us. Well, we all have a voice and it is so important to use it this Thursday. I hope to raise awareness of the relevance and importance of making the parent voice heard in Thursday’s elections. I’ve been considering the Main Three Party opinions and their relevance to all of our Autism & SEND families. It is apparent from the promises that are made (and they are wishful promises that we need to support and get behind) that some parties care about our families and other do not. 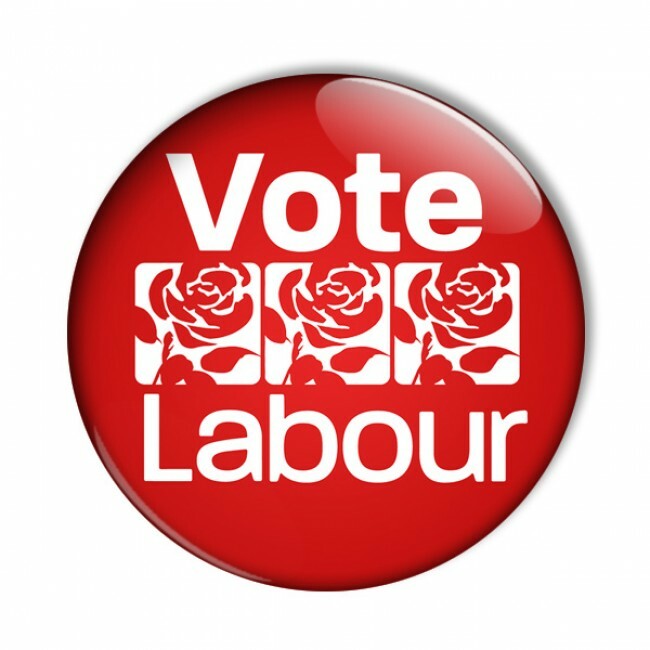 In terms of favourable voting for our ASD SEND families, it has to be Labour for me and normal people like me and my family. We are not rich and we rely on the system for our healthcare, our Education and we expect it to be provided at the best possible standards, we are used to our services being funded and to be able to trust Professionals with our children, and for invisible disabilities to be recognised and continually acknowledged. Only decent NHS, Social Care and Education funding will achieve this fully functional role that many children access easily, yet is made difficult for children of ASD SEND. 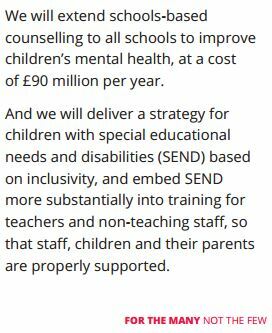 Now this is a mention at least, however it does nothing to say how they will do this and how it will be funded, relying on the fact that all Healthcare Professionals and Education Settings will comply with their wishes and the Lib Dem desire to support SEND children is not sufficient engagement. Let us not forget, this all relies on whether or not an SEND has been identified in the first place, and what it takes for the children families to get to that very important point. They mention the word Autism once, in a flippant and second hand manner, lumped in with Learning disabilities. Now i find this dismissive of high functioning Autism and those with other invisible conditions that do not have learning disabilities, this is dangerous territory in my opinion. Invisible disabilities are already way underfunded and the Tory statement that the two should be combined is unacceptable in my view and an indication of their long-term money saving endeavours…potentially a further reduction in services to those who are not easily diagnosed as Autistic, and with all of the cuts that the conservatives are insisting they will still make post the Election, i simply cannot see how or believe that they intend to fund the massive overhaul of services that needs to take place in healthcare and education for the Autistic and SEND communities. The NHS cuts include unfunded CAMHS, a service that the majority of children with invisible disabilities need access to. Constant cuts to to local Councils leads to inadequate children services, lack of training and massive lack understanding, causes huge problems and extra unnecessary workloads dealing with unfounded cases of Child Protection. 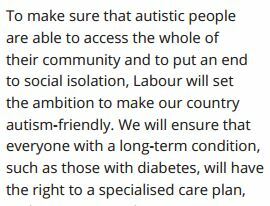 None of this looks likely to change within the Tory manifesto promise, nor going forward after Thursday.. “We have a specific task to improve standards of care for those with learning disabilities and autism.” Again, i wonder how they will roll this out considering the lack of money and the lack of Autism awareness that this one sentence screams. Ok, so for my money, it is Labour all the way. 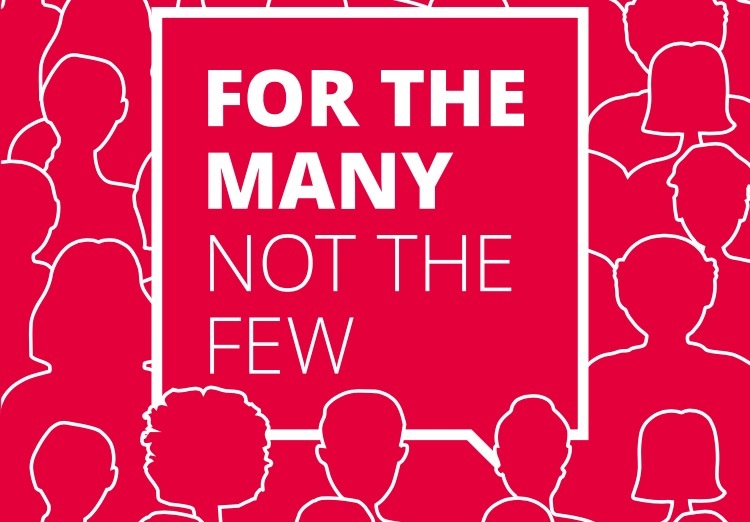 To get our voices heard we firstly need to be understood..The Labour manifesto tells us straight away that they ‘get’ autism, it is in the language, the tone and the coverage it gets within the manifesto. There are many references to Autism and SEND – but aside from that, it is written with both fact and empathy. 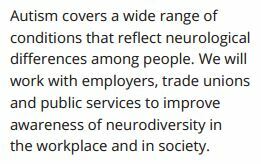 They speak of “Neurological differences”, “Neurodiversity”, “inclusivity” and “support” for children and Parents..the manifesto goes beyond simply making a brief reference to Autism & SEND for the sake of ticking a box as with the other Parties. These promises seem attainable. With more money put in to the NHS, a diagnosis will be better timed and therefore have better long term impact for all involved. This obviously avoids the massive cost implications that a no-diagnosis could potentially turn through with unrecognised system being left to fester. Early diagnosis and correct support for ASD and the whole family will not only save money, it will save families. It will save lives…just by getting it right first time. By funding better resources a Labour party is our only hope of gaining the appropriate understanding, funding and ongoing support for the long journey that SEND is…This journey beings with a GP or Health Visitor Appointment and goes all the way through to additional Teaching Assistants in school, flexibility of thinking and up to date autism training in every sector, moving all the way through to DLA or PIP payments. An early understanding will set up our growing kids to not have a constant battle to explain themselves, or to be understood in the wider world. In our personal situation, i feel that the NHS and Social Care were incredibly unaware of the reality and importance of gaining the right diagnosis and ‘seeing’ the disability of our son at all. Had the small and insular team been sufficiently funded, or had i had time to approach the CCG to insist on expert in ASD PDA, we could have avoided the allegations of Fabrication and Induced Illness that the ‘team’ decided to tarnish me with. Had they been better trained with up-to-date Autism advances then, perhaps my questioning their competence might not have been so challenging to them and the rampant parent blaming and inherent culture of incorrect personal judgements that ‘Professionals’ think that they can lay at the doors of our homes. We would never have had to prove our innocence of FII and pay a Specialist via Private consultation to gain our ASD PDA diagnosis. One that has now been rolled out across the three quarters of my family. An horrendous fight to save our children, my partner and I were treated like dirt by the ‘System’ and the Professionals. NOW, if we had been able to tap in to expert opinion in the early stages, listened to when we asked, and experts been funded by the CCG prior to Occupational Therapists ill-advised referral to Social Services, perhaps our story would have never occurred. As it happens, the lack of understanding in Autism families and our version of events is a far from a one off, it is a silent epidemic within the NHS and Social Care system, one that is worsening all of the time and I put this down to lack of funding, lack of knowledge and lack of empathy…something that the Labour Party and Jeremy Corbyn do in fact promote and align themselves with improving massively for ASD and SEND.